Gingerbread is one of those smells that automatically makes you think of the holidays. 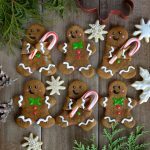 Gingerbread cookies are one of the most delicious festive treats that I can think of, and this year I made a healthier version- vegan gingerbread cookies. After all of this holiday baking (AKA the most fun EVER) I have declared my vegan gingerbread cookies my official favorites- both to make and eat! After experimenting a couple of times (and fixing some mistakes I made with my last batch), these cookies turned out super soft and chewy and all of the spices gave them so much flavor! Cookie decorating is my favorite so I decided to go all out on these cookies. If you’re feeling lazy, or just want to eat the delicious cookies and you’re not so much worried about how they look, feel free to make them in the traditional round cookie shape. I love to decorate though, so I cut mine out into the shape of a gingerbread man and decorated them with a cute little face and outfit. For some extra festive peppermint flavor, and an adorable look, I also baked some of mine holding little candy canes. This part was a little tricky though. If you try baking the cookie with candy cane, it will melt all over the cookies. To fix this, I used a wooden stick to put in the place of the candy canes while the gingerbread cookies were baking. Once the cookies were done and had cooled off a little bit, I replaced the sticks with the candy canes. Want more vegan holiday recipes? Try making Vegan Snowflake Sugar Cookies! Delicious vegan holiday gingerbread cookies holding candy canes. First use a hand mixer to beat the butter until it is smooth (you may want to leave the butter to sit out of the fridge for awhile before you begin baking so it is easier to mix). Add the sugar and then mix again until you get a smooth consistency. Keep adding the rest of the ingredients and mixing. I like to leave the flour for last because I think that it makes mixing easier, but that's just me! After all of your ingredients are combined and you have created a dough, tightly wrap your dough in plastic wrap and refrigerate for an hour. This is an important step in order to make sure your dough doesn't fall apart and you can create shapes with it. After your dough has chilled for an hour, take it out of the fridge and begin rolling it out with a rolling pin (remember to flour the surface that you are rolling on as well as your rolling pin). Start cutting out your shapes and place on a baking sheet. *Optional* If you would like your gingerbread men to be holding candy canes, place a bamboo rod in the spot and position in which you would like for them to hold the candy cane. Bake them with the bamboo rod in their hands and once they come out of the oven, replace the rod with a candy cane (while they are still warm). Bake your cookies for about 8-10 minutes at 350 degrees Fahrenheit.